From decadent medieval popes to modern televangelists with private jets, religion and money can make for an unsavoury mix. But why do we think of charity – care for the poor and the sick – as a good thing in the first place? People in the Graeco-Roman world didn’t think so: they mostly thought the poor and suffering deserved what they got. This segment looks at the contrast between early Christian attitudes and actions towards the poor, and the attitude of people in ancient Greece and Rome. JOHN DICKSON: Big cultural ideas don’t just pop out of nowhere. They emerge slowly, after decades, even centuries of contest in the marketplace of ideas. And this is the original marketplace of ideas: the famous Agora of Athens, where the greatest philosophers battled out their teachings and won their students. It’s also where the first Christians came in the middle of the first century, with their news of a crucified Messiah and all that that entails for life and love. Their influence at first must have been tiny – barely a blip on the radar of classical society. But give it two centuries, and the impact was unparalleled. Athens was the intellectual centre of the ancient Mediterranean. Socrates, Plato, Aristotle, and many others, spent time in this city thinking and teaching about science, philosophy, and, of course, morality. Much of this teaching would come to influence Western history – but thankfully not their thinking about the poor. 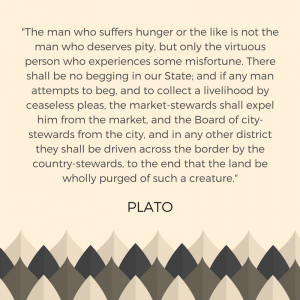 Plato taught that in the ideal city – which, of course, is one ruled by philosophers – there would be absolutely no poor people, but not for the reason you might think. ACTOR (PLATO): The man who suffers hunger or the like is not the man who deserves pity, but only the virtuous person who experiences some misfortune. There shall be no begging in our State; and if any man attempts to beg, and to collect a livelihood by ceaseless pleas, the market-stewards shall expel him from the market, and the Board of city-stewards from the city, and in any other district they shall be driven across the border by the country-stewards, to the end that the land be wholly purged of such a creature. JOHN DICKSON: Other philosophers made compassion for the downtrodden sound almost illogical. 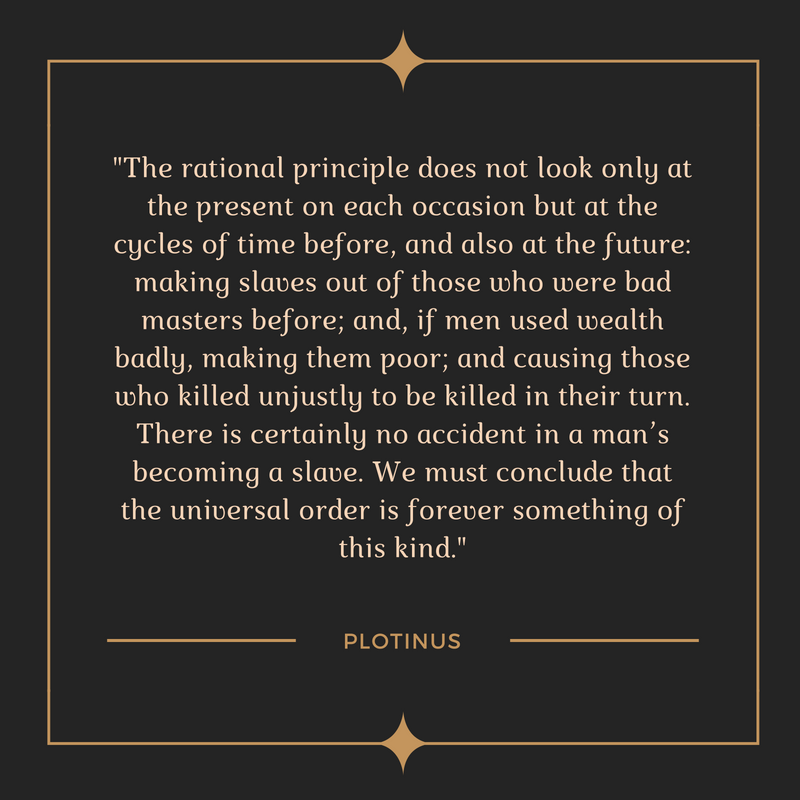 Plotinus founded what’s called the neo-platonic school, and part of what he taught was that there’s a moral logic built into the very fabric of the universe. So that if you end up poverty-stricken in this life, or a slave, or something like that, it’s because of bad deeds you performed in a previous life – he taught a kind of reincarnation. The poor, in other words, often deserve to be poor. 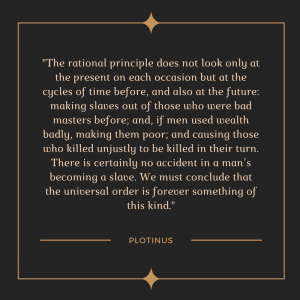 ACTOR (PLOTINUS): The rational principle does not look only at the present on each occasion but at the cycles of time before, and also at the future – making slaves out of those who were bad masters before; and, if men used wealth badly, making them poor; and causing those who killed unjustly to be killed in their turn. There is certainly no accident in a man’s becoming a slave. We must conclude that the universal order is forever something of this kind. EDWIN JUDGE: The churches in the first few centuries did practice compassion in a practical money based way by actually providing poor relief and that kind of thing. And this was greatly criticised by the ethical critics of the first churches, that’s in the first three centuries, that they were wrong to do this because the weak by definition deserved to be in the inferior position. Because the whole system in the ethical Greek view is coherent, rationally, and therefore goodness and badness is not to be decided by somebody’s problem. The question has to be, did they not deserve it? And the normal answer is, “yes, they deserved to be there”, therefore there’s no need to do anything about it. JOHN DICKSON: This is certainly not to say that no one cared for the poor. Emperors and other wealthy benefactors did open their storehouses in times of need, and they put on public games when people were bored. But this “benefaction”, as it was called, always came with a catch. Benefaction was only available to citizens, not the great mass of destitute people in the city. And there was always an expectation that the recipients of such gifts would repay their donors with public honour. The connection between donations and honour was so great, that one of the words for this giving was philotimia, the “love of honour”. Donors loved their honour so much that they gave knowing they would receive public praise in return. This wasn’t charity; it was a contract. The group most similar to the Christians was the Stoics. They were famous for their “courtesy”. But it wasn’t quite Christian care. EDWIN JUDGE: When we say, “you don’t really care”, we mean, “you’re just pretending to worry about my problem, you’re not really worried”. That’s why we say, “you don’t really care”. So, care for us means actually bearing the cost – when you actually do something about the person you allegedly care for. It is very different in spirit from courtesy. This is the real difference between the Stoic and the Christian bond between one person and other. In the Christian case, it is commitment to their problem, to share it. In the other case, it is recognition that there’s a difficulty, you offer politeness but that protects you from any grand involvement. LYNN COHICK: The Graeco-Roman writings, let’s say of the Stoics, for example, would talk about gift giving, and would talk about how it’s important to care for someone else. But always the structure was: like helped like. And it was a very highly stratified society and they wanted to keep it that way. Christianity comes along, and in its writings, it just smashes the hierarchy to bits, and it says that you give to someone who can’t repay it. That changes how people think about who they are. It brings down the proud, and it lifts up the lowly. JOHN DICKSON: The first Christians felt obliged to show charity to all because it reflected God’s character. TERESA MORGAN: I think that insistence by Christianity that God is always loving and always trustworthy and always just, and because of that Christians are called always to practice those same goods towards God, and always to practice those same goods to one another, that is a very big change in thinking from the ethics of the Greek and Roman world, where the gods may be just but may not, where the gods may love human beings but may not, where being merciful might be the right thing on a certain day but might not, where loving your neighbour might serve you but might not. The Christian insistence that if those things are good they are good for everybody and they are always good – I think that was transformational for the Roman world and then for the Christian world and is perhaps the single greatest contribution of Christianity to public life. Do you associate the church with care for the poor? Why or why not? Share about a time in your life when you’ve been struck or confronted by poverty. Imagine living on only $2 per day. Using the website of a supermarket, create a meal plan for one week with only $2 per day for food. How does this compare to your current diet? 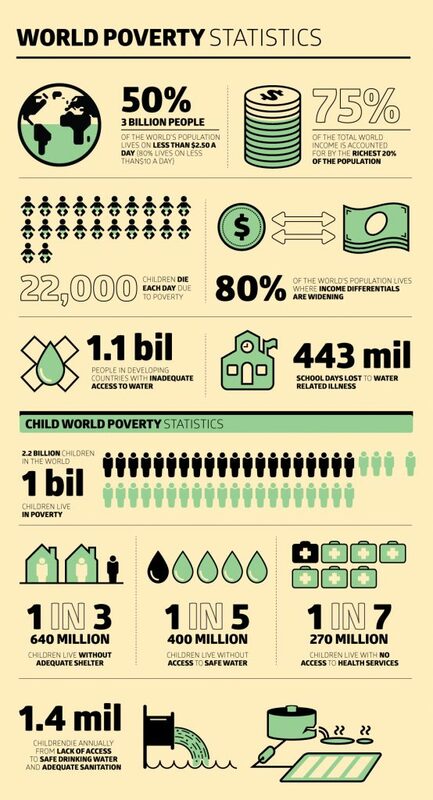 Look at this infographic on world poverty from infographic.ly. What is your reaction to this infographic? What particularly stands out to you? On the lines below, mark how much you agree or disagree with the following statements. 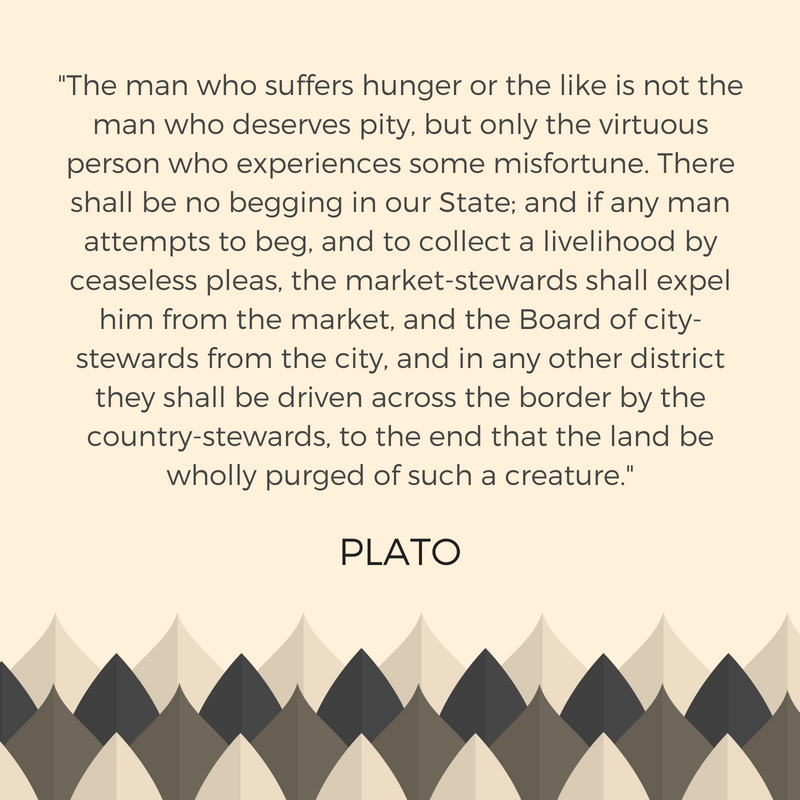 Read the following quotes from Plato and Plotinus that describe their attitudes towards the poor. Write a one-sentence summary of each quote. What stands out to you about these views? Why did Greek and Roman ethical thinkers criticise the early Christians for their actions towards the poor? Describe the motivations of emperors and wealthy benefactors who gave to the poor. What were the differences between the Stoics and the Christians in the way that each group cared for the poor? What are the “those things” that Teresa Morgan is talking about in this quote? Do you agree with her? Read Proverbs 14:31, 19:17, 21:13 and 29:7. God’s relationship to the poor? How God’s people should treat the poor? What does John call his readers to do? What motivation does he give them? What do you think is the difference between loving with “words or speech” and “with actions and in truth”? Who are some of the poor and needy in Australian society today? Make a list of at least three groups. Brainstorm a few ways your school could care for one of these groups. Imagine your school is holding an event to help, or raise money for, a group of the poor and needy in Australia. Write a text description and choose a cover image for a Facebook event page promoting this event. In your description, you might like to reference the video or a Bible passage used in this lesson. Research an Australian faith-based organisation that is fighting to end global poverty. Examples include TEAR, World Vision, Baptist World Aid, and Caritas (plus many more!). Create a PowerPoint or Prezi presentation outlining the work they do, and how their faith provides the basis/motivation for their work.